(Bloomberg) -- The skepticism of hedge funds in the face of this year’s gravity-defying stock rally has been paying off this month. 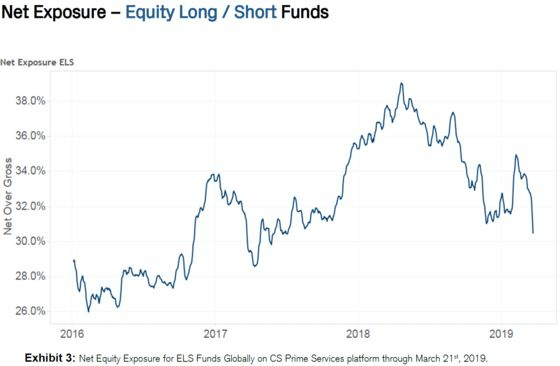 With net exposure at the lowest since 2017 as bearish positions expanded, equity long-short funds on Credit Suisse Group AG’s prime brokerage platform have gained 2 percent in March through Friday, compared with a 0.6 percent rise in the S&P 500. “Both stock selection and the recent shift in net positioning have contributed to hedge fund outperformance as growth concerns prompt central bank accommodation, curtailing the rally in risk assets,” Mark Connors, global head of risk advisory at Credit Suisse in New York, wrote in a note. As the market rally lost steam amid flashing recession signals and a lack of progress in the U.S.-China trade talks, the smart money’s oft-noted reluctance to chase the 2019 rally has helped performance in recent weeks. Hedge funds have gained 7 percent this year, Credit Suisse says, trailing the 12 percent increase in the U.S. benchmark. The U.S. and euro-zone central banks have turned dovish as economic data deteriorated and contradicted a rally that has been led by cyclical stocks. Meanwhile, quantitative funds are up just 2.6 percent this year, whereas commodity trading advisers, which follow momentum signals, are down 0.6 percent, according to Credit Suisse. Macro funds’ and CTAs’ net exposure is the highest in at least 10 months as traders added new long positions over the past three weeks. Even in energy, hedge funds’ net exposure increased only modestly this year, despite WTI crude’s 32 percent jump, Credit Suisse said. Cautious hedge funds can’t declare victory, however. After a pullback, oil surged and stocks rose Tuesday as risk appetite rebounded.